Add a new look to your bedroom with carefully selected printed, chenille or quilted bedspreads. You can match our bedspreads with our sheet sets. Bedspreads add warmth to your bedroom and offer a comfortable night’s sleep. It’s one of the easiest ways to add a little more softness to your life. 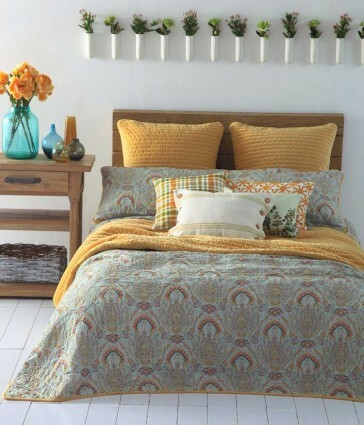 Be inspired with our 10 hot selling bedspreads to create a beautiful statement in the bedroom. Representative of paths in our travels, this gorgeous 100% cotton, ivory bedspread is pintucked, hand embroidered with ivory ribbons and finished with hand quilting. Inspired by traditional Turkish Royal designs & colour; this vibrant coloured bedspread has a warm and exotic appeal. Finished with a co-ordinating pattern, Palma bedspread will add both style & elegance to any bedroom. Instantly create a modern style in any space with this lightweight bedspread. Detailed with a quilted grid stitch adding simple elegance to the look of your bedroom. Available in three great colours; cream, taupe and charcoal. Catalina Coral bedspread has been inspired by classic European fabric design. The lovely coral & white colourway is finished with an elegant scalloped edging. The Chelsea Cream by Bianca beautiful bedspread made from soft cotton chenille with classical appeal. This bedspread is easy care, will wash up perfectly each time, and will be cherished for years to come. A stunning hand quilted bedspread in a soft French grey cotton, enhanced with our signature style French knots and running stitch border. Matching pillowshams and euroshams also available. This hand quilted chambray bedspread in oatmeal is embellished with strips of velvet ribbon and hand embroidered crosses, and finished with a textural pin tucked, hand quilted border. The Naja Bedspread Set Range Rosewood by MM Linen features a rich textural design thate creates a luxurious master bedroom. The delicately embroidered floral design on plush polyester velvet lends the bed a distinctive stylish finish. Also available in Deep Teal. Incorporating the classical colours of navy and white, this contemporary bedspread is detailed with circular embroidered patterns. A modern and lightweight choice to be included in any bedroom. The luxurious soft peach skin fabric adds comfort and luxury. Introducing the reverse coordinate european pillowcases and cushion in the same pattern will ensure a flawless look. The Jordan bedspread is made from soft easy care fabric and is printed in bold stripes of blue tones and is fully reversible. Complete the look with european pillow shams and matching cushion. Please note the pillowcases, europeans and cushions in this design are cut from various parts of the bedspread fabric and therefore may differ from the picture shown.